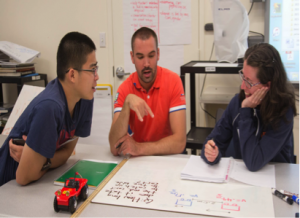 STEMteachersNYC hosted 4 full Modeling InstructionTM workshops this summer. During this time, we also hosted 4 high school interns. This provided us with some unique perspectives about what it is like for students to witness teachers engaged in professional development. Personally, I was curious to hear what students would pick up on, and what they thought about watching teachers learn. 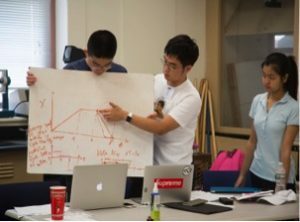 Yi Li, STEMteachersNYC’s Operations and Research Director, guided these four 16 year old students and encouraged them to observe teachers on their learning journey as they participated in a highly effective teaching method known as Modeling Instruction. Yi assigned the interns the task of writing reflections, and much of what I read is simply worth sharing. 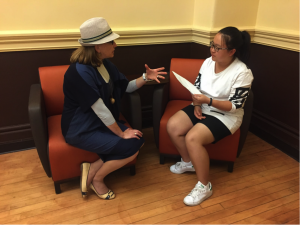 Touchingly, the student interns were keenly aware of and impressed by the type of dedicated teachers that show up to professional development during their coveted summer vacation. Ahh how satisfying to hear students noticing the dedication and motivation of so many teachers. As a teacher and a Modeler myself, I found the students reflections on target and quite insightful. High quality professional development, like what STEMteachersNYC and AMTA provide, truly is a gift to their students.